Most people reading this blog today will probably consider this slightly old-fashioned, but I received a newspaper clipping from my mother in the post yesterday (yes, I mean a physical piece of paper that arrived in an envelope with a postage stamp on it). The title of the article (online here), which was published in the Austrian quality daily newspaper “Die Presse”, roughly translated to, “Genetic engineering is spiralling out of control”. The idea was to create homozygous insertional deletion mutations of a target gene, in their case the yellow gene in Drosophila. When yellow is mutated heterozygously in females (i.e. in only of the two genomic copies) the flies look normal/wild-type because mutations in this gene are recessive and the gene is located on the X chromosome; only once both copies are mutated does the phenotype manifest: albino flies. Since males only have a single X chromosome they are always albinos if they inherit the mutated yellow gene. Gantz and Bier built a DNA construct that expresses Cas9, the DNA endonuclease, and the guide RNA targeting yellow in both somatic and germ-line cells. 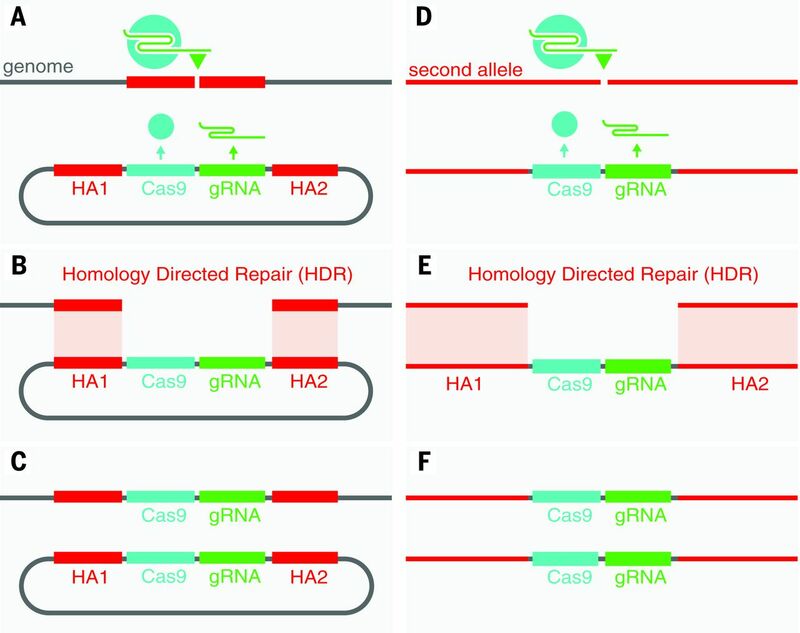 However, the special feature of their construct was the flanking homology arms (HA; depicted in red): these facilitate the insertion of the construct at the site of cleavage by Cas9 via homology-directed repair. This means that the genome now stably expresses one copy of the Cas9/gRNA combination. Next, the second copy/allele will be targeted and again the construct is inserted in the DNA, disrupting the yellow gene. If this approach didn’t work you would expect first generation female flies, progeny from a cross between wild-type flies and flies containing the DNA depicted as a circle in panel A above, to all be phenotypically normal. However, they actually found female albino flies in these crosses. When these white flies were crossed to wild-type males they found that almost 100% of those offspring were white, although one would expect only the males to be. So their MCR approach clearly worked, and in a way it violates the age-old rules of Mendelian inheritance. In their conclusion they stated that MCR may, “provid[e] a potent gene drive system for delivery of transgenes in disease vector or pest populations, and potentially serv[e] as a disease-specific delivery system for gene therapy strategies”. Gene drive “involves stimulating biased inheritance of particular genes to alter entire populations of organisms” (Pennisi (2014)). This approach may rapidly disseminate mutations that inactivate virulent traits in various disease vectors, such as the Anopheles mosquito, which acts as a vector for the malaria parasite Plasmodium falciparum. Gantz and Bier also wrote that they are, “keenly aware of the substantial risks associated with this highly invasive method. Failure to take stringent precautions could lead to the unintentional release of MCR organisms into the environment”. In a comment on the paper their security precautions are mentioned: the flies are kept in three layers of tubes and boxes, locked behind five doors operated by fingerprint recognition to ensure they do not escape into the wild. However, just as Baltimore et al. (2015) called for caution and open discussions concerning CRISPR applications with regards to (human) genome-editing in general, Esvelt et al. (2014) demanded extreme caution in the use of CRISPR-based gene drive systems. They especially emphasised the need to both molecularly and ecologically contain these systems: at the molecular level, for example, the targeted gene must not be present in wild species; at the ecological level experiments should only be attempted in inhospitable environments where organisms will not easily find mating partners. Their hesitation to fully embrace this new approach is understandable. For example, what if the guide RNA becomes mutated and the nuclease starts targeting other genes as well? Furthermore, such gene drives employed by the government of a country, for instance, to combat a disease vector will almost inevitably cross political borders. If introduced into endangered species by accident they could eradicate them entirely. It seems to me that it will be quite difficult to test such approaches (in the manner of a clinical trial, say) without actually conducting the experiment in the wild. And somehow inexplicably these articles entirely slipped under my radar, whereas the recent human genome-editing experiment caused much more uproar although it is arguably a lot less prone to “spiral out of control”. Pennisi, E (2014) U.S. researchers call for greater oversight of powerful genetic technology. Science Insider: http://news.sciencemag.org/biology/2014/07/u-s-researchers-call-greater-oversight-powerful-genetic-technology. Accessed May 3rd 2015. This entry was posted in CRISPR, Factual, Opinion and tagged biochemistry, biology, Cell biology, CRISPR, Drosophila, gene drive, Genome-editing by Victoria Wang. Bookmark the permalink. Would we actually care if an endangered species of mosquito becomes extinct? Maybe that’s simply the price for making malaria an endangered species. What is the worst that could happen, if the guide RNA mutates? Without homology, the cassette won’t be able to copy itself to that site. Why is it bad? Because we made it? Why is it bad to carry out a minor modification in a wild species? Homing endonucleases are well known genetic parasites that use homology dependent ‘repair’ to copy themselves into their target sequences. Interestingly, they don’t normally occur in animal nuclear genomes, for various evolutionary reasons. Human designed gene drive systems are likely to become fixed in the population and then degenerate. The present work is therefore simply the replacement of homing endonucleases with Cas9, with a very predictable, obvious result. It is of course easier to modify CRISPR to target new sequences, but this is far from being either creative or novel in any way. A specialised journal would have been more appropriate than Science magazine. CRISPR researchers are overstating the risks of the technology not only to feel powerful and important, but also to get attention and funding, while destroying the public reputation of scientists in general in the process. Making minor modifications in wild species in itself does not seem bad to me when the purpose is to increase human health. However, I’m not sure we can foresee long-term consequences of such interventions, although I concede that, as you say, without the flanking homology arms a change in the guide RNA should not propagate the resulting mutation. I suppose the underlying issue here is that, to inform the public, one has to make science interesting and use phrases that catch people’s attention (e.g. “violating the age-old rules of Mendelian inheritance”), but at the same time be extremely careful not to over- or understate the facts. Writing a decent blog read by a handful of people already seems like quite a responsibility, so I imagine writing for the BBC Science section, for instance, is a lot more challenging. Yes, it’s important to communicate with the public. However, you rarely hear plant scientists talking about how terrifying their research with GM plants is. Would a politician with no real understanding of the science let nuclear physicists do any experimental research, if they constantly talked about worst case scenarios? As scientists, we should highlight the benefits of our research instead of supplying arguments to those, who would have innovative research shut down. I’d personally be afraid that CRISPR could go the way of the dodo and follow GM crops into the grave (in Europe). Quiet self-regulation is always better than letting the government restrict your freedom. I agree, of course, that the necessary precautions should be taken when using gene drive to construct mutants for research. Placing Cas9 outside the cassette and/or making it inducible seem like obvious options. The greatest risk I can see is that Drosophila research could be impacted by the potential contamination of fly stocks complicating genetic studies and limiting further downstream uses of CRISPR technology. However, even gene drives can theoretically be reversed. Imagine, for example, an ‘immunised’ version of the yellow gene without the original target sequence, but instead with an intron containing a gene for a guide RNA forcing Cas9 to cut in its own gene. This would automatically restore the wild type genotype in the modified flies and erase Cas9. I really enjoyed this post and as a new blogger and Drosophila researcher myself I feel that you got the subject matter spot on! In reply to the above comment thread, I would say that any scaremongering is almost certainly a product of the press and not really something that scientists have contributed towards. The advent of CRISPR technologies has after all revolutionised the way that work is done in the lab and it would not be of any benefit to researchers if people started to view the technique with scepticism. The caution surrounding gene drive approaches stems for our lack of knowledge on the area. I believe the use of gene drives for research purposes in the lab is an unnecessary risk. If you haven’t seen it already, there was a nice paper from Simon Bullock’s lab at the LMB showing that CRISPR with independent transgenes is so effective at inducing somatic mutations that the approaches used by Gantz and Bier have few benefits, which do not outweigh their inherent biosafety risk (open access preprint of the article on BioRxiv can be found here: http://biorxiv.org/content/early/2015/04/01/017384). The hypothetical gene drive reversal mentioned above is a nice idea but as someone who has used the CRISPR/Cas9 system to create transgenic flies before, the suggested experiments would be a considerable time commitment and it would perhaps be better if the situation never arose at all! Thanks for the comment and for sharing that link!